Hey, just so you know ... this post is now about 4 years and 9 months old. Please keep that in mind as it very well may contain broken links and/or outdated information. 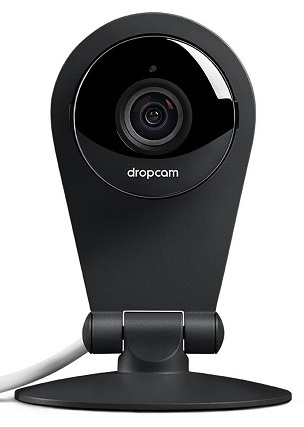 The beauty of the Dropcam (other than its sleek, all-metal and glass industrial design) is the simplicity of the setup and usage: plug it into your computer via USB cable (or use the app on your smartphone) to connect it to your wireless network. Then move it to its final location and your done. 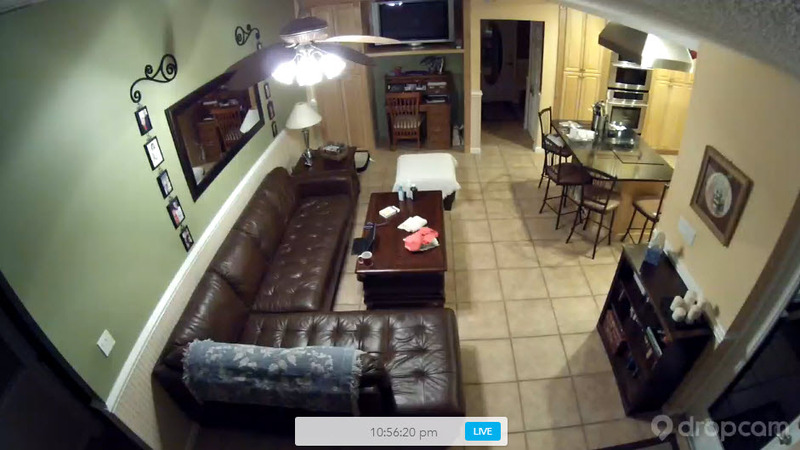 After that, all of your setup and monitoring is done via the Dropcam web site or iOS/Android app on your smartphone or tablet. The hardware specs of the Dropcam Pro are impressive for such a small camera: 1920×1080 HD resolution at up to 30fps, high-powered night-vision infrared LEDs, 130-degree field-of-view, microphone and speaker (for two-way audio). The slightly cheaper Dropcam has 1280×720 HD resolution at up to 30fps, slightly less-powered night vision, and a 107-degree field-of-view (more differences here). The Pro also has BTLE built-in for use with the upcoming Dropcam Tabs wireless motion sensors. The camera is solidly built and comes with an all-metal stand with a strong hinge for angled viewing, power brick, 10′ USB cable (very nice!) and a circular plastic mounting bracket (with wall anchors and screws provided). For a more detailed review of the Dropcam Pro, see this article. Having a small, wireless, HD camera and being able to view live video remotely is great, but what Dropcam really wants to sell you is its Continuous Video Recording (CVR) cloud recording service. CVR lets you review the past 7 ($10/mo) or 30 ($30/mo) days of video, create and save clips and timelapses, and configure custom notification events. You get 14 days of CVR free when you activate your first Dropcam so you can evaluate the service. Without CVR you can still view a live feed of video, use the two-way audio and scheduling features, and get motion/sounds notifications (but the motion alerts will be generic, for all motion whereas with CVR you can create custom activity zones). The service costs 50% less for each additional camera, so a second camera would be $5 or $15 a month. This also means you can pick and choose which cameras have the service, if that makes sense for your setup. One thing to keep in mind about the CVR service is that your cameras will be constantly uploading HD video to Dropcam’s servers so you’ll need to consider your bandwidth limitations: Dropcam says a single camera requires ~200kpbs of upstream bandwidth. Privacy is another concern. Dropcam was recently acquired by Google (actually by Nest, but Nest was purchased by Google as well earlier this year). As expected, Dropcam’s security policy states that the video feed from each camera is encrypted and cloud recordings are stored on Amazon’s S3 servers (no video is saved if you’re not a CVR customer). But if you’re not completely comfortable with your Dropcam footage being stored in the cloud you may want to look elsewhere and possibly roll your own home-stored solution. If you want to learn more about the internal workings of the Dropcam, check out these two blog posts here and here (not surprisingly, they run Linux). I did have a problem setting up my second camera. The setup program for connecting the camera to my wireless network kept failing with a cryptic message: “This camera has encountered an error. Please reconnect the camera and begin the setup process again.” Despite multiple attempts I was not able to pair the camera to my network. I was, strangely, able to use the Android app on my Samsung Galaxy Note to finally get it working. It then had a few connectivity drops, but eventually stabilized and hasn’t had a problem since. I have to wonder if maybe there was a back-end firmware update involved (again, since everything is handled by the Dropcam cloud, even software updates are automatically pushed without user intervention). So far I’m pretty impressed with the Dropcam Pro. The website and apps are pretty polished, the CVR service is really slick (albeit a bit expensive), and I love having two-way audio on my iPhone. Being able to hear what’s going on in the room and respond to it is really cool (even with the slight delay). I also like how the camera just snaps into the mounting bracket, which means its easy to take it down move it someplace else temporarily. The wide-angle lens does introduce a bit of a fisheye effect, but it’s not too bad and well worth the convenience of not needing a PTZ camera to cover a wide room. One minor gripe: the USB cable is cream-colored. Why not white or a matching black? Of course, this now means I don’t have a one-stop-shop for managing/viewing my camera setup anymore. 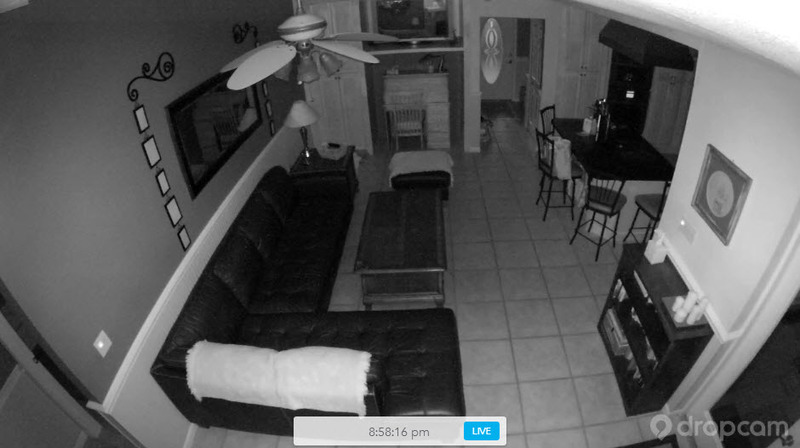 My TRENDnet cameras monitor the outside and are handled by ZoneMinder (and eyeZM) and now the indoor cameras are Dropcams with their own separate app and cloud storage. This could be fixed by using all Dropcams but despite finding lots of requests for an outdoor/weatherproof version on the internet, there doesn’t seem to be one in the pipeline anytime soon. Time will tell if I find this new split setup annoying, or, more likely, just adjust to it. 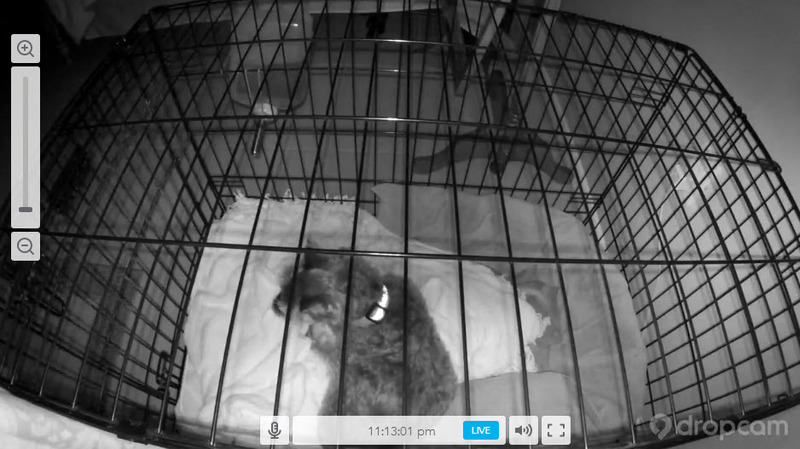 Right now, though, I recommend anyone looking to set up a quick-and-easy video monitoring solution to check out Dropcam. 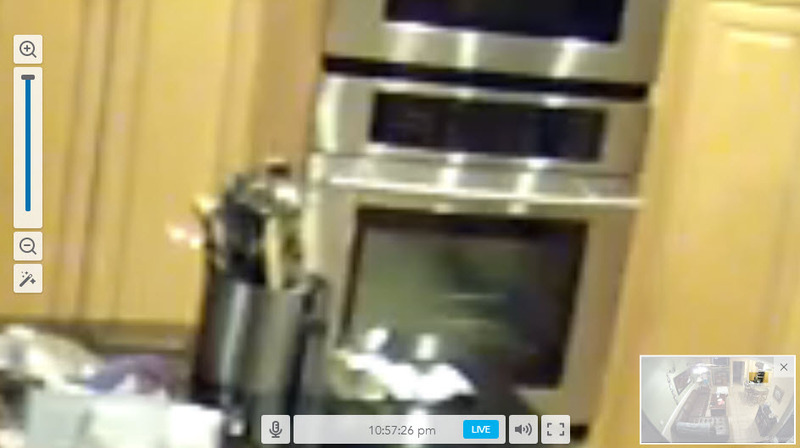 I’ve also added a regular Dropcam to my setup. Other than the (inexplicably) silver mounting bracket, the Dropcam looks just like the Pro but has a narrower field of view (107 degrees vs. 130), and lower quality zoom (4x vs 8x), night vision, and audio quality. 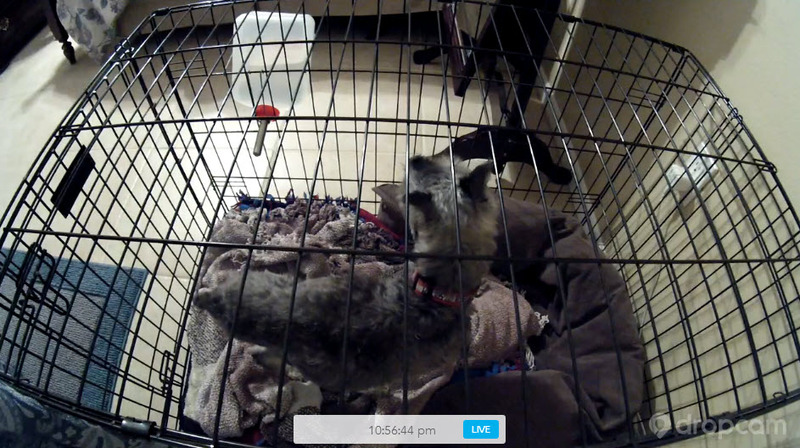 I’m using the Dropcam as a crate/pet monitor, though, so the lesser features work out just fine. What did you use config wise to set it up with Zoneminder? Unfortunately, you cannot use Dropcams with ZoneMinder as they only work with the Dropcam Cloud DVR service. Nest is finally coming out with an outdoor version of their camera. It looks like it’s wireless, like the indoor cameras, but has a 25 foot power cable and magnetic mounting options. I like my outdoor dome PoE cameras, but I’ll keep an eye on the Nest Outdoor once it’s released later this year. I ran into a problem with the Dropcams … they won’t connect to a hidden SSID. When I put in the EdgeRouter-X last summer, I set up a separate wireless network (and VLAN) for the cameras and other internet-of-things devices in the house. There’s no real need to have this SSID broadcast, so I tried turning it off. Once I did, all of the Dropcams dropped off the network. When I turned broadcast back on, all the Dropcams re-connected. I “spoke” with a Nest agent and she was able to confirm that Nest cameras do support hidden networks (which I knew, based on this support article), but she could not confirm that the older Dropcam models would (and she said they probably don’t based on my experience). I’m not going to buy newer Nest cameras just to be able to hide the IoT SSID, so I’ll have to live with this for now.